I decided, for Mother's Day, to take myself to breakfast. That's not really as exotic as it sounds. I had to get out of the house and run a couple of errands so breakfast seemed like a logical way to start the run. I went to Dunkin' Donuts. I believe the whole product placement idea in movies really took off with "ET: The Extraterrestrial". I'm thinking I remember sales of Reese's Pieces jumped some astronomical number, like 1000%, after the movie showed ET eating Reese's Pieces. Since then, I don't think a big summer movie is complete without some sort of product featuring a tie-in to it. Dunkin' in on the bandwagon this summer with the Chocolate Lunarmax donut shown at right. This is a tie-in to the upcoming "Men in Black 3" movie coming out Memorial Day weekend. Hey, it's chocolate and the same price as any other donut. I'll try it. 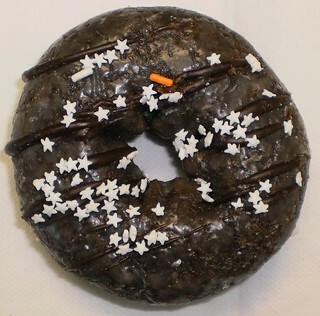 It's simply one of their chocolate glazed donuts with extra chocolate ribbons and these star sprinkles. The wayward orange sprinkle is from the strawberry frosted donut I purchased with this one. Those are always covered in sprinkles. There's nothing more remarkable about this Lunarmax donut than with any other chocolate donut DD serves. Back in March, they had these two donuts which featured cherries. Now those were unique and good. They currently have an apple pie donut that I like. So, I would suppose the movie has a spot where the Men in Black team goes into a Dunkin. Or possibly, they don't and Dunkin just agreed to promote the movie. Whatever. I tend to view the quality of the movie by how much we're exposed to pre-release. If I see a lot of product tie-ins, billboards, bus placards, adverts on my sidebars when I browse the Internet, I think the movie is going to be a flop. They've spent their budget on trying to convince people it's good when it ain't. But, as I don't think I've seen much for MiB3, just donuts, I'm a bit encouraged. MiB2 was not a stellar movie. It was a good way to start my morning. If you like their glazed chocolate donuts, you'll like this. Just ignore the trappings that say, "Product Placement!"